I first tried to wear this banana leaf dress to Caitlin's wedding shower in Charlotte a few weekends back but never got the chance because of the weather. WELL this past weekend I was at Allison's wedding shower and found it was the perfect spring dress to wear! I also got a ton of compliments on it throughout the day and that is how you know your thoughts of love are confirmed lol. It's just the EASIEST dress to wear. 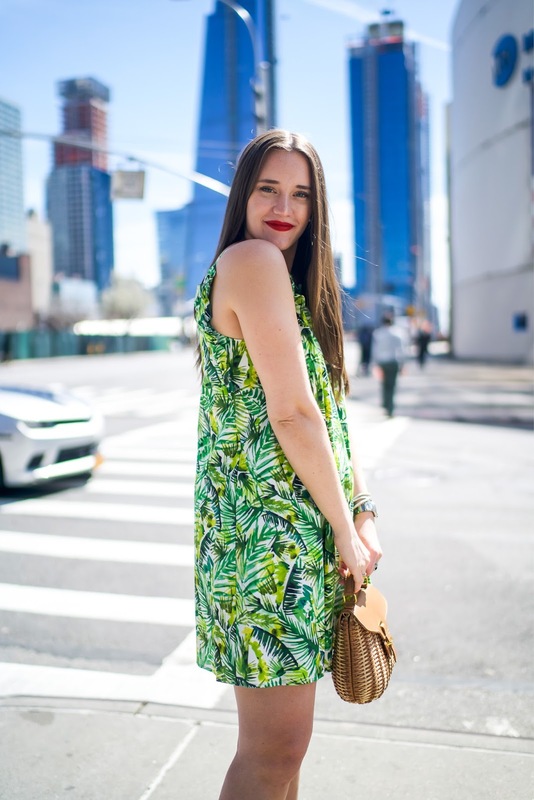 This banana leaf dress is comfortable, you throw it on and you're good to go. The dress itself (the material) is very thick so you don't need a bra but I wore a strapless one without any issues. The ruffle around the top gives it a little extra flair and the shape of it is shift-y but still very flattering. As for sizing, you MUST GO ONE SIZE DOWN. The medium (my normal size) was a BAG on me. I'm wearing a small here and it fits so much better. If you are in between sizes I might even size down two sizes. It runs very large.